Matrix Opti Straight Ionic Hair Straightening Cream (Resistant) is a professional hair straightening kit by Matrix with multi Ionic technology. It is an easy to use, gentle hair straightener that effectively straightens the curl of natural curly hair. Matrix opti straight can be used as a cold smoothing system or more prominent results can be attained by combining with a flatiron and blow dryer. Hair looks relaxed, manageable and totally straight and sleek hair with full of shine. It is easy to use by cold smoothing or by combining with a straightening iron or blow dryer to make you hair straight. 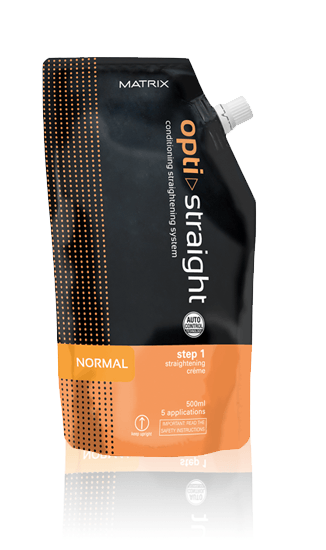 Straight’s Multi-Ionic technology that delivers top-class condition straightening. It’s got customized strengths to optimally enhance any hair type and an Asian Tea Fragrance which neutralizes the ammonia odor and gives you an uplifting aromatic experience even during the treatment itself. Use up to 5 applications. Step 1 - Prepare the Hair: Perform preliminary strand test. If hair breaks or discolors, do not straighten or use any other straightener or relaxer product. Step 2 - Applying Straightening Cream: Gently shampoo hair with a clarifying shampoo, rinse and towel blot; Part hair into 4 sections; Wearing gloves, pour Straightening Cream into a nonmetallic bowl; Virgin applications: beginning at the nape of the neck take a horizontal parting 1/2 inch deep; Use a tint brush to apply product rapidly section by section from 1/2 inch off scalp through ends of hair; Retouch applications: only apply Straightening Cream on the re-growth. After applying Straightening Cream to several partings, comb through gently with a wide-tooth comb and minimal tension. Comb downward, guiding hair into a straight configuration. Smooth hair with fingers. Step 3 - Processing: Cover entire head in plastic wrap. Be sure the hair is smooth before the plastic wrap is applied; Set timer for the appropriate number of minutes using timing as following: Sensitized/Color-Treated - 10-25 minutes; Normal - 15-30 minutes; Resistant - 20-35 minutes; Strand test after first 10 minutes and every 5 minutes after. Step 4 - Rinsing: Rinse hair thoroughly with warm water for 7-10 minutes. Towel dry carefully; Gently remove any tangles with a wide tooth comb. Step 5 - Flat Ironing: Blow-dry until hair is 80% dry; Part into 4 sections; Begin at the nape in one section and take a horizontal parting thin enough to see through. Gently comb through parting; Iron hair approximately 1/8 inch from scalp. Keep hair very straight and tangle free by keeping your comb in front of the iron while ironing. Iron each parting 2-3 times; Hair is sufficiently ironed when it feels silky, looks shiny and no longer coated; Repeat this process until all hair has been ironed. Step 6 - Applying Neutralizer: Part hair into 4 sections as before; Wearing gloves, apply Neutralizer with an applicator bottle beginning at nape from scalp through ends. Do not apply directly to scalp. Smooth hair with fingers onto plastic cape; Leave on for 10 minutes while continually smoothing hair with fingers so that it remains straight during neutralizing; Rinse hair thoroughly with warm water for 5-7 minutes; Towel blot hair and gently remove tangles with wide -tooth comb; Blow-dry hair with fingers until 80% dry, then use brush to create finished style; Remember: Tell client not to wash , pin, band, braid or clip hair for 48 hours. Wait 14 days before coloring hair. DIRECTIONS FOR COLD SMOOTHING: Follow directions above excluding Step 5.